A federal judge on Monday ordered the release of previously sealed documents filed in the case against Julian Assange, offering up new details about the U.S. government's allegations against the WikiLeaks founder. The original affidavit and criminal complaint were made public in a Virginia federal court for the first time since they were filed in 2017, and they include chat logs between Assange and former U.S. intelligence analyst Chelsea Manning. 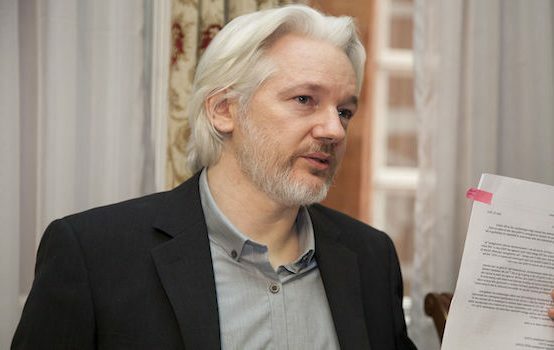 Assange was arrested last week in London at the request of U.S. authorities, after the Ecuadorian government decided to stop allowing Assange to remain in their U.K. embassy. The Justice Department later unsealed its indictment against the WikiLeaks founder. The U.S. is alleging that Assange sought to help Manning crack a password in order to access a Defense Department network where classified information was stored. They point to chat logs allegedly documenting communication between the two individuals as evidence of the conspiracy. The affidavit released Monday states that U.S. authorities were able to identify Assange as the person Manning was communicating with through hints he dropped during the chats. For example, the individual wrote in March 2010 that he enjoyed debates and "[j]ust finished one on the IMMI, and crushed some wretch from the journalists union." IMMI referred to the Icelandic Modem Media Initiative, a legislative proposal under consideration in Iceland at the time. Assange at that time had recently participated in an event at the University of Iceland that included discussion of the IMMI, according to the court filing. And the person Manning was communicating with said in late March 2010 that they would be traveling to Norway for an investigative journalism conference; Assange spoke at such an event in Norway at that time, according to the filing. The affidavit states that Manning also believed she was communicating with Assange, but that “it took me four months to confirm that the person i was communicating was in fact assange." The document also details WikiLeaks’s release of secret documents obtained by Manning, with the two discussing how to crack a password. But it notes that "it remains unknown whether Manning and Assange were successful in cracking the password," related to the conspiracy charge Assange is currently facing. “Investigators have not recovered a response by Manning to Assange's question, and there is no other evidence as to what Assange did, if anything, with respect to the password,” the document states. Manning was convicted in 2013 on multiple counts, including violations of the Espionage Act and copying and disseminating classified military field reports. She allegedly downloaded four almost complete databases from different U.S. agencies that included sensitive information about the Afghanistan and Iraq wars and Guantánamo Bay operations, as well as other State Department cables. Manning served nearly seven years in prison before former President Obama commuted her sentence.